Though the reductionist approachto biology and medicine has led to several imp- tant advances, further progresses with respect to the remaining challenges require integration of representation, characterization and modeling of the studied systems along a wide range of spatial and time scales. Such an approach, intrinsically - lated to systems biology, is poised to ultimately turning biology into a more precise and synthetic discipline, paving the way to extensive preventive and regenerative medicine , drug discovery  and treatment optimization . A particularly appealing and effective approach to addressing the complexity of interactions inherent to the biological systems is provided by the new area of c- plex networks [34, 30, 8, 13, 12]. 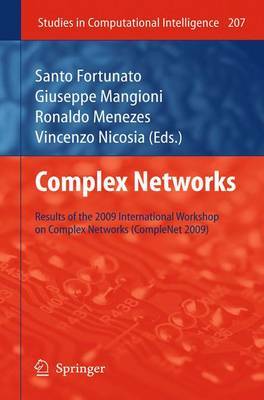 Basically, it is an extension of graph theory , focusing on the modeling, representation, characterization, analysis and simulation ofcomplexsystemsbyconsideringmanyelementsandtheirinterconnections.C- plex networks concepts and methods have been used to study disease , tr- scription networks [5, 6, 4], protein-protein networks [22, 36, 16, 39], metabolic networks  and anatomy .